Welcome to this year's 26th issue of DistroWatch Weekly! The great variety of free operating systems available today makes it possible to satisfy every user scenario; from extremely conservative to bleeding edge - there is a distro for everybody. Today we'll focus on the former. CentOS, a clone of Red Hat Enterprise Linux, is a product designed for those who prefer stability and reliability over cutting-edge features. 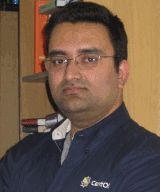 But as explained by Karanbir Singh in our interview, CentOS can be used in surprisingly varied deployment setups, including VoIP servers, high-performance computing or development workstations. Read on to find out more. In the news section, Mandriva finds investors and promises a new release early next month, Oracle continues its secretive attitude towards OpenSolaris, Linux Mint releases a tool for easy localisation of its distribution, and NetBSD publishes a strategy guideline for testing the popular multi-platform operating system. Also in this week's issue, an explanation about TRIM on solid state drives (SSD) and a final list of new packages that will be added to the distribution tables on DistroWatch. Happy reading! CentOS, a Linux distribution built by compiling the source packages for Red Hat Enterprise Linux (RHEL), has emerged as the most popular RHEL clone available today. Although often perceived as an operating system for mission-critical servers where stability and dependability are far more important than cutting-edge features, CentOS can be used in other deployment scenarios, including specialist servers or development workstations. Today we talk to Karanbir Singh (pictured on the right), a CentOS developer, about the reasons behind the project's continued success, attempt a comparison of CentOS with other similar distributions and enterprise operating systems, and describe the process of building CentOS from the source code that Red Hat makes available with every new release. DW: Karanbir, thank you very much for your time. Let's start with the usual. Can you please introduce yourself? How old are you? Where do you live? What do you do for living? KS: Hi, my name is Karanbir Singh. I am 35 years old, love Belgian beers, enjoy travelling and a good steak. Born and brought up in India, I moved to the UK in May 2001. I am currently based in South East London working as the Infrastructure Lead for a major on-line services company. DW: When and how did you get involved with CentOS? KS: When Red Hat moved from the Red Hat Linux to Red Hat Enterprise Linux (RHEL) model it left my work place, of the time, in a dilemma. We had a lot of in-house experience on the "Red Hat" platform which also meant that we were very capable of self supporting our internal requirements. The RHEL platform, on the other hand, was and still is targeted primarily at people who need both business and technical support - neither of which was high on our priority list. The options at the time were to rebase to an alternative like Debian or SUSE or to hedge our bets with the faster moving target that was to become the Fedora distro. However, none of those options seemed natural and would all require a fair bit of effort. Plus, introducing a drastic change in our work process is something that I didn't want. Luckily, it was at that point that I came across the White Box Enterprise Linux (WBEL) distro and we saw the third option - to continue to use a Red Hat platform, while being able to self-support our own requirements. So after a bit of testing, we started moving out production base over to WBEL, and then actually started doing the package rebuilds in-house. It was a few months later, while talking with Johnny Hughes Jr, that I realised that WBEL was being too specifically targeted at an internal requirement that the only developer had. So we came up with a grand plan of starting our own project with a more open set of goals, better defined and easier for people to identify with. Our driving force was not the implementation goals that people had. Our driving goals were more along the lines of making sure we get a stable and well-managed platform together and the technical depth that people who already used this platform could bring into a common pool. 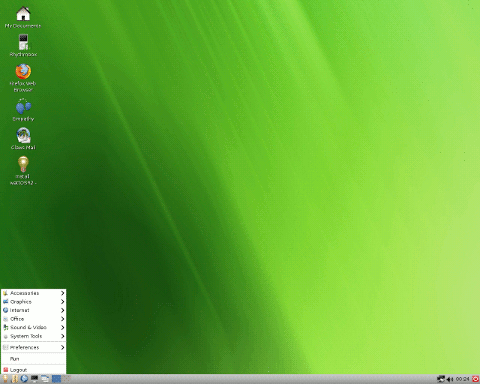 But it was Donavan Nelson who pointed us at CentOS, which had already got a release for CentOS 3 out of the door. And after a bit of deliberation, Johnny and I decided that rather than start our own project we would adopt CentOS 4, and the two of us became the "CentOS 4" team. Now almost six years later, we are still involved with the project and doing a lot of the work within the CentOS core team. Of course, personal life needs to take a priority and we all need to take breaks every now and again from CentOS "efforts". DW: At times it seems that you are the main PR guy of the project, announcing most of the CentOS releases and providing information to third parties. Is this now your official function or is it just your own initiative to make CentOS more visible to the big world? KS: I think it's a bit of both, official role and my own desire. Helped along with a case of implied visibility. There are quite a lot of people contributing in their own ways. And many of them, including me, put in dozens of hours every week towards CentOS and the various efforts in and around the project. It just so happens that things I'm working with at the moment has been that much more visible publicly, so plenty of people see and hear quite a lot from me. There is every effort to make CentOS more popular and we all like to get the word out there about the platform. If you say that the small things that I do have been making an impact, it makes me feel good. Along the same line, one thing I would love to do more of is be able to travel to various open-source and business-centric shows to be able to talk to people about CentOS. But the day job gets in the way! The necessity to earn a living means that I can only do two or three such events every year. DW: Although there have been several attempts at recompiling source code for Red Hat Enterprise Linux (RHEL) and create a "new" distribution, CentOS is now by far the most successful of these. What do you attribute this success to? KS: There are a couple of things that contribute towards this. Firstly, there is the whole issue of trust. We have demonstrated over a long period of time that the userbase can expect a consistent, reliable and stable platform. And a large part of that comes from the extensive efforts we make in being and staying true to our upstream, Red Hat. As I mentioned previously, the goals within CentOS are not to target implementation, but to target this platform. What this means for the user is that they can trust the product that comes through CentOS and know they get the accrued benefit of the applications in the distro having been through the Red Hat testing process as well. Another factor that contributes towards our popularity is the idea of peer recommendations. It has been a long and hard road, but we have always encouraged new industry segments to evaluate and grow with us. For example in early 2005, with CentOS-4/x86_64 we were able to reach out to the VoIP industry in a big way. We tried to make sure that the opinion leaders in that industry were aware of CentOS, knew what our goals were, had a route to provide direct feedback and know that their feedback would matter. End result was that most of them went out recommending CentOS. I've heard rumours recently that CentOS might be the largest installed platform for VoIP providers worldwide now! The hosting industry is another place where we had similar success. Both of these market segments are areas that I worked on personally; let's not forget that there are many other people who have had similar success with CentOS in their own respective areas of interest. A third factor that has helped spread CentOS is availability. We have always tried to make sure that we have plenty of mirrors, plenty of bandwidth to those mirrors and spread them out all over the world. Today there are more than a hundred machines that are managed by the CentOS Infrastructure team and more than 500 external mirrors. Pretty much every major open-source mirror network in the world carries CentOS. It was a lot of effort getting there; in many cases it was one of us having to repeatedly badger the administrators in order to get them to carry our content. Another major issue, and perhaps the most underrated aspect of CentOS, is that it makes for a fantastic platform to build emerging technologies and to host rapidly changing targets. I know many people will be surprised about that. The general impression is that CentOS is a stable platform, with a strongly reliable ABI tracking application base that does not divert from its core functionality during the course of a release. And they are all right. But because it does all this, it also makes for a fantastic platform to change a couple of specific applications that are important to you, and be able to rely on the fact that the other programs in the distro will not change drastically. And to be able to do this, yet receive security and bug-fix updates for the platform is of immense value to developers. For example, if you want to build and host a Ruby on Rails application, CentOS is a great choice. It allows you to use whatever mechanism you want to build, test and deploy your application, while assuring the user that the environment and platform are secure, dependable and stable. And it is this feature that contributes in large portions to the fact that almost every emerging technology today has some level of roots in CentOS. Cloud computing, messaging, high-performance clustering, virtualisation, appliances, VoIP, commodity level hosting, etc are all areas that CentOS has been involved with. Then there is the huge community around CentOS - an extremely capable and knowledgeable pool of people who all work to achieve different things using the same platform. So if you run into issues, there are usually quite a few people who would be very ready to help out over the lists, IRC, forums or even direct email. This does come with its caveat of community level support so one does need some level of awareness and an interest to learn about things in order to best use such a resource pool. If you need a phone number to call when things break, and prefer to pay someone to answer that phone and know what they are talking about, you should be talking to Red Hat! Of course, many of these points are not specific to CentOS and would apply to any rebuild, but I feel we have had the right level of juice and focus to make all of them applicable to us. DW: Do you have any ideas how many people out there use CentOS? As an example, Fedora tracks the number of unique IP addresses that connect to its update servers, perhaps CentOS has something similar? With CentOS being offered for free, it wouldn't be entirely unimaginable to think that CentOS servers now outnumber RHEL servers? Or am I completely off the mark? KS: There are really two questions here. Firstly the idea of numbers. I have no idea how many people use CentOS, but we know it's lots! Six figures for sure. Seven figures? Maybe. Tracking IPs works for Fedora due to the demographic and the install roles they target. With the CentOS userbase, it's not that easy. For example, many organisations and universities run their own local mirrors, and CentOS installs from inside there will never hit the YUM repositories that we run. Similarly we know there are large installs in China and Japan, and we rely entirely on external mirror hosts to serve those areas. The second part of your question is about how our numbers stack up against RHEL's. In my opinion, that comparison isn't really worth doing. We are not competing with or trying to hurt the business that Red Hat is in. I know there are edge cases where people who could potentially be using RHEL are using CentOS, and similarly people who might be better off with CentOS are using RHEL instead. But in the grand scheme of things what RHEL targets and what we are doing are quite different. If a user needs business and technical support, along with a SLA and an assurance that they can get that support at any time for their application, they really should be talking to Red Hat. On the other hand, if there is enough expertise in-house to self support your application and be able to have the flexibility to rely on community for support then CentOS is a real option. Then there are areas where people just need a stable platform to host an alien application or role, which will need a minimal level of involvement in administration, like HPC and appliance machines. Again, CentOS makes for a good fit here, since that would allow you to change as much or as little as you like with no implications on support availability. It's also not uncommon to hear about hybrid CentOS / RHEL setups where people use CentOS in development roles, with RHEL hosting their production role. So I don't think the number comparisons with RHEL and CentOS matter. What matters is that people have a choice, and the ability to pick something that works best for them on a platform that they are familiar with. DW: Last year CentOS gained further momentum when not one, but three different CentOS books from major publishing houses appeared in print. Do you see this as a springboard to further expansion into, say, CentOS certification? Are there any plans to offer a CentOS training that could find some attraction among companies that are put off by the high cost of the Red Hat Certified Engineer (RHCE) certification? KS: It was great to see CentOS specific books out on the shelves; made sweeter by the fact that some of that content come from people who are deeply involved with the community. With respect to certification and training if there is a process that can be put into place which can guarantee, within reason, the level of competence of a "graduate", I don't see any reason why we could not do that. On the other hand, given that the product base is so similar, I imagine the best value in a CentOS certification would be as a compliment to a Red Hat certification. Based on what I've seen in the last few years, most people who ask for an RHCE expect the candidate to be working with RHEL. So one needs to keep that in mind as well. DW: The CentOS project prides itself for having an excellent relationship with Red Hat. Can you expand on that? Some might find this relationship rather surprising given the fact that CentOS effectively undermines Red Hat's business model by offering the same product and long-term security support without a charge. KS: Because the target audience is so different, RHEL and CentOS interests don't overlap too much. Think of it like this: RHEL is a service and support contract you get a Linux distribution with. CentOS on the other hand is a Linux distribution that you can download and install, and expect to put in the hard work yourself in order to support. The CentOS community has a very good and functional support mechanism in the mailing lists, IRC and forums. But no insurance company is going to give you business liability indemnity against that. Similarly, if you need to run the latest kernel for some specific function, doing that on RHEL will invalidate your support contract with them. DW: On the enterprise Linux scene there are two major players - Red Hat and Novell. Both offer the source code of their products, but only on the Red Hat side we have seen efforts to create something out of it. Why do you think there is no "community" edition of Novell's SUSE Linux Enterprise Server (SLES)? KS: The big difference between Red Hat and Novell is their attitude towards the sources. Unlike Red Hat, Novell does not publish all their sources. Till very recently they also didn't publish a complete set of tools that would be needed to make a community SLES possible. And as far as I can tell, they seem to prefer working through the openSUSE effort rather than accepting an open source community rebuild effort around SLES. Further highlighted by the fact that sources for their updates in SLES are not published publicly at all. I accept that it has been about 18 months since I looked last, so they might have changed their attitude now. Then there is also the lack of interest. I am aware of at least two groups of people who have considered going down the route of building up a community SLES-based distro, and abandoned the idea when they found little or no interest. Most people who want to use the SUSE platform seem happy with openSUSE. I can only imagine that this hurts Novell overall, since there is very little openSUSE penetration into either the business or academic setups. DW: On a more technical note, can you describe the CentOS release process? Once you see a new version from Red Hat, what happens next? Is the process of building new ISO images for release mostly automated? How much internal testing is done before the DVD images get uploaded to FTP servers and an announcement goes out to the media? KS: Our process is fairly automated at this time, but still relies on people doing the actual approvals. It would be nice to get to a stage where the process could run end-to-end completely automated, but we are not quite there yet! Hopefully soon we can start looking at that, at the moment it's just not a major target. When a new release is announced at Red Hat, we would download all applicable sources. Step one is to rebuild all the sources against the same targets used upstream and try to use the same build order as much as possible. Once this is done, we do update / upgrade testing against these packages. For example, for the 5.5 release, we did extensive tests for upgrades from the various 5.x releases and also from 4.x releases. Once we are satisfied with the results, and are reasonably sure that we produce the same results with our packages as upstream would - we move onto the building ISO stage. Which are then handed over to our QA team. Our QA team is small, but focused and works in a private group. This allows us to have a very high rate of churn and rapidly fix issues. During the 5.5 release, it was not uncommon to have four sets of ISO builds on the same day and yet have a relatively good level of QA feedback. At the moment our QA effort is limited to installation scenarios, upgrade and repository testing. What we would really love to do is expand this to include application functionality testing, but lack the manpower to do so. If anyone wants to adopt some applications and can devote some chunks of time a few times every year, please come and talk to us. Our target is to get a new release out of the door within 4 weeks of upstream. DW: CentOS is often seen as solid and stable, yet outdated operating system suitable as something that can be installed on a server and that will work for years without much maintenance. And yet, the CentOS community is making a solid effort in providing unofficial up-to-date software packages for the desktop. Is this the result of a demand by users? Does CentOS as a desktop system have some attraction in certain user scenarios? 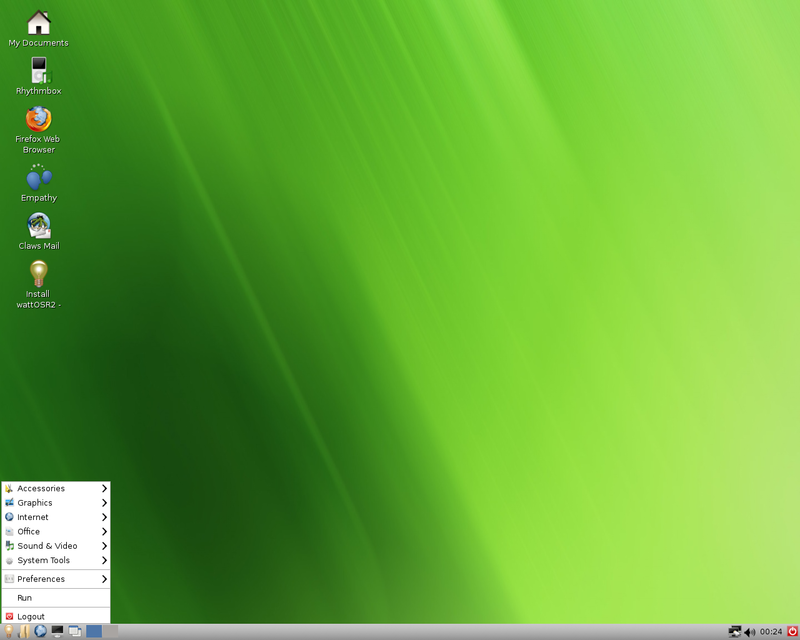 KS: Yes, CentOS makes for a great desktop and workstation distro. Like I said before, since its a stable platform you can freely add and remove components from the system using either your own builds or third party repositories, yet feel secure in the knowledge that the base operating stack isn't going to break or change on you in a long time. This really does transfer the upgrade cycle over from what is enforced by faster moving distros like Fedora and Ubuntu, over to the user where you can then choose when and how you want to upgrade what. It has been over three years since CentOS 5 came out, but I still find users running CentOS 4 happily with the latest versions of Firefox, MPlayer etc. Also, one needs to keep in mind that Red Hat do a lot of kernel backports, so while the main kernel version number does not change, new and better hardware support is always going in. I know the existing repositories spread for CentOS isn't ideal at the moment. Users still need to make some efforts to locate the right ones for them, then might still need to contend with conflicting packages, etc. Putting in place a better system is quite high on the agenda, if anyone has ideas on what and how we could do that, please get in touch! DW: Karanbir, thank you very much for your answers and keep up the good work! Many members of the Linux community eagerly await any news about the future of Mandriva which has been rumoured to have serious financial difficulties. Last week, a French web site published an exclusive report claiming that the company has been "saved by investors", or sauvé par des investisseurs (article in French). Subsequently Caitlyn Martin published a short summary of the story at O'Reilly Community: "After weeks of concern about the 'catastrophic state of its finances' and an indefinite delay in the release of version 2010.1, the French website LeMagIT is reporting that Mandriva has been saved by new investors. The article quotes Mandriva Director General Arnaud Laprévote: 'Today the company found investors who decided to invest in the company, in order to give balance to the organization and to find a good economic model.' He added that 'the community and users no longer need be concerned.' Due to regulations regarding confidentiality the identity of the new investors was not disclosed. Laprévote went on to explain: 'we were aware that the existence of Mandriva was threatened, and today that is no longer the case.'" There is further good news on the release front. According to this mailing list post by Anne Nicolas, the delayed Mandriva Linux 2010.1 should be out on 5 July: "As announced on IRC on Friday, we will release final ISOs for 2010 spring in coming week. As a matter of fact we are pushing the last packages tonight. Official release is planned for 5th of July." Unfortunately, there is also some bad news to report. Pascal Terjan, a kernel developer in the services of Mandriva for the past six years, has left the company to take up a new position with Google: "Mandriva was a great experience. I have worked here for almost six years (and contributed for a few years before), met a lot of great people, and worked on a lot of different kinds of software. This experience also had wrong sides, like commercial side where most motivated and competent people have left quickly or became demotivated. Engineers tend to resist more but for some reason it seems that the top management has always tried to demotivate everyone. I hope Mandriva has a long life and that I can still use it and contribute to it, but feel quite pessimistic currently." The state of OpenSolaris, following the recent takeover of Sun Microsystems by Oracle, continues to puzzle the developers and users of this open-source operating system. Last week, The Register's Timothy Prickett Morgan fired up the Google search engine in order to do some serious detective work on the situation. The result is an interesting article entitled Solaris, OpenSolaris, and the Oracle wall of secrecy: "Foxwell reiterates what Oracle's top brass was saying back at the end of January, which is the last time any official communications came out of Oracle regarding either Solaris, the hardened, commercial-grade UNIX, or OpenSolaris, the development version of the platform not really intended for data center production. Back then, a day after Oracle closed its US$7.4bn acquisition of Sun, Larry Ellison, Oracle's co-founder and chief executive officer, heaped praise on Solaris while still talking up Linux, but no one said anything about plans for Solaris 11 (which was due around the middle of 2010, according to Sun's plan from 2009) or for OpenSolaris. This freaked out Solaris shops enough that Dan Roberts, a director of product management at Oracle who is responsible for OpenSolaris and Solaris as he was for a few years at Sun, had to reassure the Solaris community that Oracle was not going to kill off the open source project underpinning Solaris." Creating re-spins of popular distributions has become so easy that virtually anybody can build a new variant and offer it for download. Now a new tool, created by the developers of Linux Mint, makes it possible to respin Linux Mint ISO images localised into an alternative language: "A new command-line utility called 'iso-localize' is now available. With this tool, users, magazines and communities from various parts of the world can now produce official Linux Mint ISO images in their language and distribute them as such. From a technical point of view, the utility reads from an existing ISO file, downloads the language packs for the selected language, sets that language as defaults and asks the user to translate the labels found in the live CD/DVD menu. It then creates a new ISO file, which behaves in every way like the original and boots directly, with full support, in your language. ... Images created with iso-localize can be considered official and distributed as such, using our name and branding. To know more about iso-localize and how to use it, please read the dedicated tutorial." Finally, a link to a rather technical article by Antti Kantee which talks about tools and strategies for testing NetBSD. The story, published on the project's official blog, is entitled Testing NetBSD: Easy Does It: "In a software project as large as NetBSD the interactions between different software components are not always immediately obvious to even the most skilled programmers. Tests help ensure that the system functions according to the desired criteria. Periodic automated runs of these tests with results visible on the web ensure both that tests are run in a regular fashion and that the results are available to all interested parties. This short article explains the NetBSD test strategies and provides a brief overview of the enabling technologies. It also details how effortless it is to run the test suite and why doing so is in every developer's, patch submitter's and system administrator's best interest. The intended audience is people with a keen interest in testing and quality assurance, and a desire to reduce personal headache." Keeping-things-TRIM asks: I've heard that without TRIM SSD performance will degrade over time. TRIM is now supported in some SSD firmware, and recently has been enhanced to support RAID systems. But TRIM does not work without OS support. Some TRIM support is available in the Linux kernel, but people are having trouble figuring out what is going on. So what's happening with TRIM? DistroWatch answers: The issues facing solid state drives (SSD) and TRIM can be a little difficult to explain, but I'll try to give a quick overview here. Hard drives tend to be fairly dumb devices as far as hardware goes. So, traditionally, when an operating system decides to delete a file, it removes references to that file rather than telling the hard disk that the data should be removed. This is a bit like going to a library and destroying a book's index card without actually removing the physical book from the library. This means that, in some cases, it's possible to get your data back after a file has been deleted by carefully searching through the physical drive. Trying to find the contents of a deleted file is a little like searching through an entire library looking for a book which no longer has an index card. Treating the hard disk as being dumb has worked fairly well for us up to this point because it means the operating system can keep track of things while the disk simply reads or writes to certain areas without concerning itself with what was there before. To a traditional hard disk, over-writing existing data isn't really any different than writing to a blank part of the disk. But then solid state drives came along and they work a little differently. To an SSD, over-writing data is different (and slower) than simply writing to a blank area of the drive. Much the same way it takes longer for a person to erase a chalk board before writing something new. The problem is that if the operating system is still treating the SSD as a dumb device, the drive doesn't know which parts of its storage have been used before (and can now be erased). This is where TRIM comes in. It's a way for the operating system to bring the solid state drive up to speed on which blocks aren't in use and can be wiped. This way the SSD can perform house cleaning and we don't run into cases where the drive is trying to wipe data immediately prior to writing. Now that the Linux kernel has TRIM support, this should all fade into the background, right? Almost. Except in cases where the feature has been backported, only the most recent kernels (2.6.33 and above) have TRIM support. Likewise, I think FreeBSD users will have to wait for FreeBSD 9.0 to get the same feature. Linux users who are on older kernels can get TRIM support via a program called hdparm. The hdparm program (versions 9.17 and up) will search for free blocks in the file system and let the SSD know which areas should be cleaned. If your distribution doesn't supply a recent release of hdparm, you can get a copy from here. So now we have kernel support and, as a backup, hdparm, so we're covered? Almost. Older SSDs may not support TRIM commands. In those cases, you'll either need to get updated firmware for the SSD or buy a newer drive. When in doubt, check with the manufacturer to see if your device supports TRIM and, if it does not, ask if the device can be upgraded. Superb Mini Server 8.1 is a Slackware-based distribution for small servers. A new release, version 1.5.2, was announced earlier today: "Superb Mini Server version 1.5.2 released (Linux kernel 2.6.33.5). This minor release clears the name of SMS to Superb Mini Server and brings new graphics and logos. Some packages upgraded and two new packages added, hfsutils and Tcl. In this release we switched to Postfix with no vda patch as the default MTA for SMS. A version with vda patch is available in SMS.Native.CD. NDISwrapper, dahdi-linux and iptables_l7 rebuilt for new kernel, don't forget to run LILO after the upgrade. A brief changelog: kernels upgraded to 2.6.33.5; upgraded to Dovecot 1.2.12, CUPS 1.4.4, Postfix 2.7.1, MySQL 5.1.48; added Tcl 8.5.8; bootsplash kernels upgraded; Openbravo upgraded to 2.50MP18; optimize Netatalk configuration; added lost cURL 7.20.1 package in SMS64...." Read the rest of the release announcement which includes a full changelog. Ronald Ropp has announced the release of wattOS R2, an Ubuntu-based distribution and live CD featuring the LXDE desktop, GNOME Office and some Mono-based applications: "wattOS R2 is finally done and released. It is based on Ubuntu 10.04. Changed the music player to Rhythmbox from Exaile; added the 'extras' package that offers support for MP3 support native as well as DVD playback - it does make the live CD larger, but makes the end user experience easier as the support for Flash, Java, fonts, and the things people like to do; added LXDM to add a lightweight login manager and replace SLIM; updated all packages to latest 10.04 supported versions; removed GIMP and added F-Spot; removed NetworkManager and replaced with wicd; updated Jockey GTK+ so it will be easy for folks to add proprietary drivers...." See the release announcement for further information and changelog. 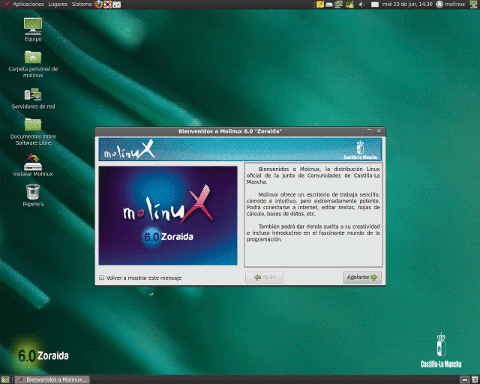 MoLinux 6.0 "Zoraida" is a new version of the Ubuntu-based distribution developed by the regional government of Castilla La Mancha in Spain and designed for use in public offices and schools around the region. The release comes with the following enhancements: new login, splash and start screens; new icon theme (GNOME-wise) as well as panel and window theme (New Wave); improved hardware compatibility; latest versions of applications included in the distribution; new software and utilities, such as Nanny (parental control), Hamster Applet (time management), KeePassX (password management), Sinadura (an application for digital signing of PDF documents), Prism (for launching web applications independently of a browser); also included are MolinuxSync (an application for synchronising group work), XBMC multimedia centre, Ubuntu One.... Read the rest of the release announcement (in Spanish) for more details. Kendall Weaver has announced the release of an updated respin of Peppermint OS One, an Ubuntu-based distribution with LXDE and integrated web-based applications: "We're proud to offer the second official Peppermint OS respin, featuring a fully updated system as of June 17 and a few other things including bug fixes and new features. Here are some of the highlights. all Xfce applications and dependencies have been removed; the notifications are prettier; we've gotten rid of pyNeighborhood; the default IRC client, XChat, has been updated to version 2.8.8 and now automatically connects to #peppermint on irc.spotchat.org; the boot splash no longer has that weird blue tint to the background; all package updates as of June 17 have been installed and tested, this includes lower level updates that the update manager will skip over due to potential stability issues." Visit the project's news page to read the complete release announcement. Mehdi Magnon has announced the release of Sabily 10.04, an Ubuntu remix with Islamic software: "The Sabily team is proud to announce the release of a new version of Sabily 10.04, codename 'Manarat'. What's new? New 'Manarat' pictures and wallpapers, Zekr 0.7.6, Thawab 3, new offline recitation - Al-Muaiqly (48 kbps); new parental web control application - nanny. New from Ubuntu 10.04: new look (new theme, window management buttons on the left); better interaction with social networks (built-in integration with Twitter, identi.ca, Facebook and other social networks with the MeMenu in the panel); 2.6.32 Linux kernel, GNOME 2.30; improved support for NVIDIA proprietary graphics drivers; removal of the previously deprecated HAL package (faster boot); OpenOffice.org office suite 3.2 (now branded as Oracle); Firefox 3.6.3; Simple Scan, a new simple scanning application; PiTiVi movie editor which can trim and combine clips, add transitions." Here is the full release announcement. After two weeks of feedback, here is the final list of new packages that will be added to the package database tracked by DistroWatch: Deluge, Google Chromium, lzip, MythTV, Privoxy Shotwell, Tor and Wordpress. F-Spot, DeviceKit and Zope will be removed. Many thanks to everybody who provided suggestions for the annual update. OpenELEC.tv. OpenELEC.tv (Open Embedded Linux Entertainment Center) is a free embedded source-based operating system providing a complete media center software suite. OpenELEC is a small and fast-booting Linux distribution, primarily designed to be booted from CompactFlash or other Flash memory card or solid-state drive, similar to that of the XBMC live distribution but specifically targeted to a minimum set-top box hardware setup based on an Intel compatible x86 processor (ARM port is in development). Utopia. Utopia is a Slackware-based distribution with KDE 4 and GNOME. This concludes this week's issue of DistroWatch Weekly. The next instalment will be published on Monday, 5 July 2010. 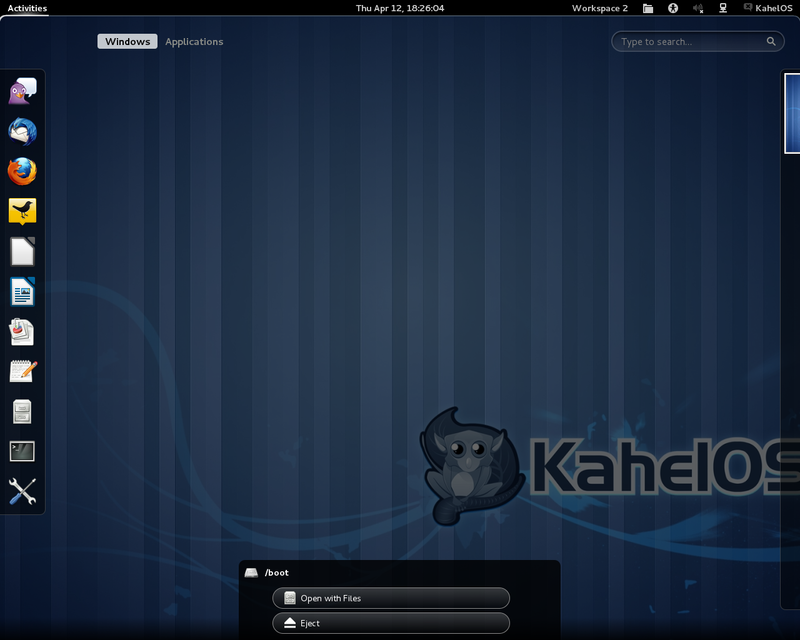 KahelOS was a Linux distribution based on Arch Linux. Its desktop edition comes with pre-configured GNOME as the default desktop environment, GNOME Office productivity suite, Epiphany web browser, GIMP image manipulation program, and other popular GTK+ and GNOME applications. Like Arch Linux, KahelOS maintains a rolling-release model of updating software packages using its parent's repositories. The distribution comes in the form of a live DVD which includes a graphical installation program.